I’m going to take a break from writing fake, passive-aggressive e-mails to stand-ins of coworkers and come at you about a very interesting topic Ownership of an artistic/creative franchise. Put another way: I’ve been thinking a lot about what it means in the modern era to be a fan of a medium that is, intrinsically, an interactive experience. That’s right! I’m going to be talking about the snafu with the ending of Mass Effect 3. Now, I’ll do my best to avoid spoilers in this, but it might be difficult to remain vague, since the ins and outs of the debate have very much to do with the specific events of the ending of the game. So, you know, don’t flame me if I let something slip. For those of you who don’t know, Mass Effect is a trilogy of sci-fi games. They’re hybrids of the RPG, third-person shooter, and adventure genres. 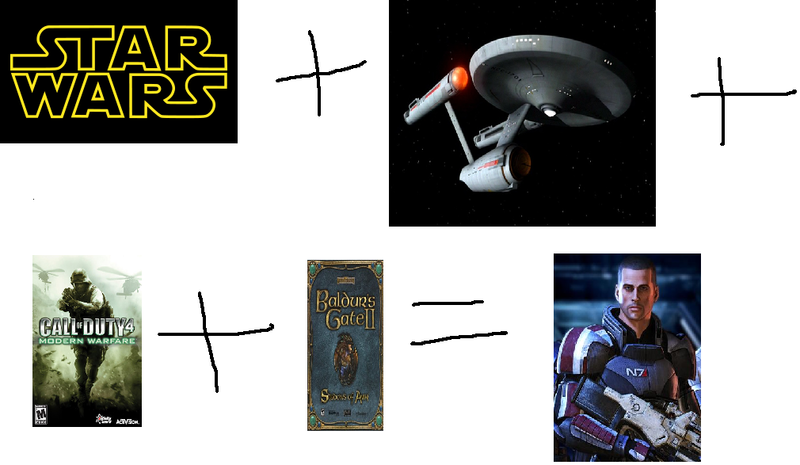 Think Star Wars, Star Trek, Call of Duty, and the old Baldur’s Gate games—if you’re nerdly like me and played them. Now, Mass Effect stands apart from a vast swath of games on the market because the installments are very well written, very immersive without seeming to try, and—thank God—have great voice acting. In many ways, the franchise is a great counterargument to people who look down at video games. I’d go into why the franchise is a great example of what can be done with games, but this is a blog post, and not a dissertation. Suffice it to say, Steam runs fantastic sales every season, and the first two games would be well worth the $15 you’d end up spending. The games have amassed a huge following, with a whopping number of players immensely invested in the game. When the third game launched, the anticipation was staggering. Bioware, the studio that developed the game, released copies into space, for God’s sake. They also promised a large amount of endings, all based on the player’s in-game decisions. See, that’s another thing that highlights Mass Effect is the importance of choice. Through the three games, the player has the opportunity to import and use a character from the previous game, thus allowing the choices made in-game to carry over to the next. This results in vastly different playthroughs for different people. For example: I was out at dinner with a couple people last week, and one guy had made a habit of killing characters who I did not know could be killed. It, uh, well, it’s got more of an impact when you play the games. Trust me. Anyway, it’s all built up to expectations in the community that the end of the third installment would be—and I’m using this word in the proper sense—epic. If we lived in the Viking age, it would have been expected that a skald would have sung of it in a mead hall. What happened, though, was something entirely different. Rather than an epic ending—the end of the Lord of the Rings trilogy, for example—we got the ending to Tinker, Tailor, Soldier Spy. A very oddly-placed-in-tone conclusion to the saga that may have been a better fit in a game on rails instead of a relatively open-world adventure trilogy. That said, the ending wasn’t bad—at least, I don’t think it was bad. I thought it was underwhelming and asked questions where there should have been answers—not to mention that it felt that the writers were really trying to be memorable instead of doing what was natural. But, if you look online on comment boards and reddit, you’d come away with the conclusion that the ending was a crime against humanity. Yes, the developers promised varied endings, and, ostensibly, the ending does not deliver that. However, as Mike from Penny Arcade pointed out, you can otherwise take the view that the third game is the ending. And, well, there’s truth to that. Trans-species wars are resolved; individuals gain redemption; others gain prestige within their people; robots are destroyed or saved; daddy issues are resolved. All of those are significant plot points in the series and, based on your choices as the player, they are wrapped up in the third game. Thus, you could say that ME3 is the ending. As you can see, it’s a charity drive with the aim of getting Bioware and EA’s attention, with the end goal of getting some more solid closure out of the ending of the ending. And, further, as you can see, it’s a charity drive donating to Child’s Play, the organization started up by the guys at Penny Arcade to benefit kids in hospitals by giving them video games. First off, I think this bit of semi-altruism is incredible. Too often you see the stereotype of enraged gamers as a variant of The Simpsons’s Comic Book Guy—and it’s often reinforced by the community. But with this drive, we’re seeing a group do something very smart—getting attention via positive action. While what the group wants may seem trite, it’s something that matters a lot to a large group of people. And while it may seem like they don’t know what they want—there are a lot of variations on what “closure” means—it’s a striking example of a pretty fractured group acting as one(ish) voice. But even more interesting is the implication that the game has changed. In the modern era where the community has unprecedented access to developers in the form of forums, interviews, e-mail, Twitter, and facebook, the question has become: Has the idea of creative ownership changed? I think we’re going to see that, at least when it comes to video games, it has. The point is often made in this movement that since Mass Effect is so dependent on player choice, the narrative is as much the player’s as it is the developer’s. There’s room for debate on either side, but there’s more backing on the side of the player than ever before. As the idea grows that the community owns the game just as much as the developers, the belief grows that the community is entitled to some sort of acknowledgment of that ownership from the developers. Now, that’s a very tricky subject, and in many ways, you can see parallels between it and the severe hatred of the prequels in the Star Wars series. I’m somewhere in the middle, I think. While I was disappointed by the ending, I acknowledge that we, as gamers, are playing by the rules of the creators. We don’t have an intrinsic right to demand the progress of a work any more than a reader of, say, Harry Potter would demand certain things of J.K. Rowling. Would I like a “happier” ending? Or even one that eschews the messy contradictions of the game’s heroism and willingly ignores the whole organic vs. synthetic resolution that my Shep accomplished? Hell yeah I would. However, I recognize that this isn’t my baby, no matter how much I’d want it to be. It’s Bioware’s baby, and they’re the only ones—well, EA, too—who have the final say. So, protest on, dudes. If you guys win out, that’s great. If not, well… sorry?